The International Society for Transgenic Technologies (ISTT) has agreed to co-sponsor another CARD Cryopreservation Course. This time, for the first time, the CARD methods will be taught in North America: the CARD-RPCI Mouse Sperm and Embryo Cryopreservation Practical Course will be held at Roswell Park Cancer Institute (RPCI) in Buffalo, NY USA. The course will be held September 15th-19th, 2014, and will be a hands-on intensive workshop. The course is organized by Naomi Nakagata (CARD-Kumamoto University, Japan, Coordinator of CARD), Aimee Stablewski (Roswell Park Cancer Institute, Buffalo, NY, USA, Co-Director of the Gene Targeting and Transgenic Resource) and Jan Parker-Thornburg (MD Anderson, Houston, TX, USA, Director of the Genetically Engineered Mouse Facility). The maximum number of participants attending this course will be 18, distributed among countries and institutions, and according the documentation provided and the interests expressed. Pre-applications will be accepted starting April 1st, 2014 and will close on May 31st, 2014. The review and selection of participants will be done by the Organizers from June 1st-15th, 2014. Registrations and payments for selected participants will be accepted from June 16th, 2014 to August 31st, 2014. If required, an ordered waiting list will be prepared and any cancellation or unpaid registration by August 31st, 2014 will be readily substituted by the first available person from this waiting list, starting on September 1st, 2014. The course registration fee is $1300 USD (with a reduced fee of $1100 USD for ISTT members). This fee includes participation in the entire course, all materials and reagents, lunches over the 5 days and one course official dinner. Hotel costs are not included in the registration fee but booking assistance will be provided, if required, at a hotel on Roswell Park Cancer Institute’s campus, where all instructors and lecturers will be also lodged, hence further promoting interaction from breakfast to dinner. The official language of the course will be English. COURSE INFORMATION: Recent developments from the laboratory of Prof. Naomi Nakagata (CARD-Kumamoto University, Japan) have boosted the mouse cryopreservation field with improved methods for fresh and frozen sperm techniques and associated optimized IVF methods that have resulted in unparalleled increased efficiencies for the cryopreservation and rescue of relevant mouse lines. The aim of this course is to introduce the new CARD methods to researchers and technicians involved in managing mouse archiving and/or transgenic facilities and willing to implement these new methods, directly taught by the team which devised them. Each participant will have one stereomicroscope and the entire set of tools, reagents and animals required to learn and practice all the methods included in the program of this course. In addition to practical sessions, the course will also include several lectures of related interesting topics for the participants delivered by experts in each field. The number of instructors and lecturers appointed is 17. It is with great sadness that we note the passing of Stanley Leibo, who died this morning, March 25, in the USA. Stanley Leibo was Professor at the Department of Biological Sciences, University of New Orleans, LA, USA. On behalf of the ISTT, we wish to offer our most sincere condolences to his family and friends. 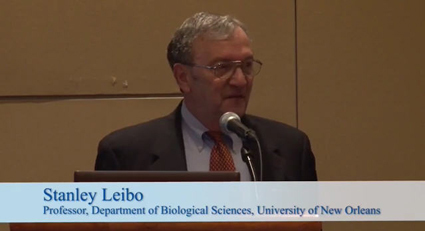 Stanley Leibo was a renowned authority in cryobiology and one of the pioneers in the cryopreservation of mammalian germplasm. His seminal publication in Science in 1972, in collaboration with Peter Mazur and David Whittingham, described the first, successful cryopreservation of mammalian embryos, demonstrating the recovery of live pups from mouse embryos that had been stored in liquid nitrogen and liquid helium. His scientific work laid the foundation for the current widespread use of cryopreservation by human fertility clinics, agriculture, scientific resource repositories, and conservation efforts preserving endangered species. In addition to his outstanding scientific contributions, Stanley Leibo will be remembered for the joy and passion he brought to teaching. He was a fixture from the beginning in the Jackson Laboratory’s Cryopreservation Course, offered both in Bar Harbor and later also in partnership with EMMA in Monterotondo, Italy, where over the years hundreds of students, including many ISTT members, had the pleasure of hearing his enthusiastic lectures on the history, theory and practice of cryopreserving mammalian cells and germplasm. Stanley Leibo was a mentor for many of us, a colleague, and most of all, also a friend. We will not forget him. May he rest in peace. 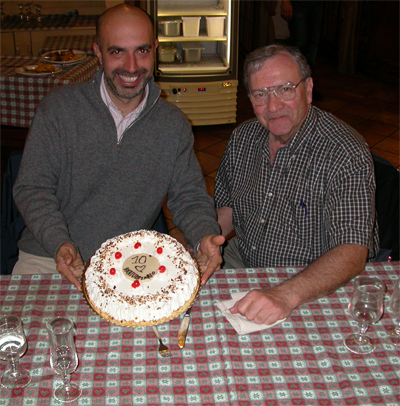 Stanley Leibo with Marcello Raspa, in Monterotondo, November 2009, at the 10th anniversary of the EMMA-JAX annual cryopreservation course (Photograph by Lluis Montoliu). Stanley Leibo’s handwriting and drawings illustrating his passion for teaching. These were made on the paper tablecloth by himself, while explaining several concepts in cryobiology to other colleagues, during the official dinner of the last annual EMMA-JAX cryopreservation course, held in October 2013, in a restaurant in Rome (Photograph by Lluis Montoliu). a tips ‘n’ tricks session, with selected short presentations. The meeting is being held in central London on Monday 19th May 2014, and is limited to 100 places allocated on a first come first served basis. Registration (including lunch) will cost £55, with IAT and LASA CPD points available to individuals with current membership. Participants are strongly encouraged to submit abstracts relevant to the meeting topic areas for consideration as either a poster or short oral presentation. For more information see the meeting advert or email GA@rspca.org.uk putting ‘zebrafish workshop’ in the title field. To register and book your place at the meeting click here. The new (2014) FELASA recommendations for the health monitoring of mouse, rat, hamster, guinea pig and rabbit colonies in breeding and experimental units have been released as open access document from Laboratory Animals journal web page. This updated reference document has been prepared by the FELASA working group on revision of guidelines for health monitoring of rodents and rabbits, formed by Michael Mähler (Convenor, GV-SOLAS), Marion Bérard (AFSTAL), Ricardo Feinstein (Scand-LAS), Alec Gallagher (LASA), Brunhilde Illgen-Wilcke (SGV), Kathleen Pritchett-Corning (AALAS) and Marcello Raspa (AISAL and ISTT Member). The previous and up-to-now current FELASA recommendations for the health monitoring of rodents and rabbits had been published in 2002 (Nicklas et al. 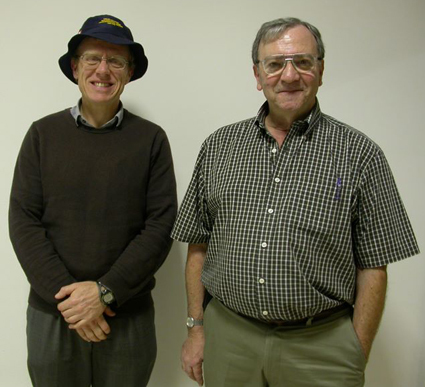 2002, Laboratory Animals). Therefore this new document, released in 2014, substitutes and updates the previous guidelines reported 12 years ago. As it is stated in the abstract of this updated 2014 FELASA recommendations document: “These recommendations are aimed at all breeders and users of laboratory mice, rats, Syrian hamsters, guinea pigs and rabbits as well as diagnostic laboratories. They describe essential aspects of health monitoring, such as the choice of agents, selection of animals and tissues for testing, frequency of sampling, commonly used test methods, interpretation of results and health monitoring reporting“. FELASA and, in particular, the co-authors of this compelling updated recommendations for health monitoring of rodents and rabbits need to be praised for this work. This document will not only help and contribute to the desired harmonization of the health monitoring programmes across animal facilities but also it will provide important elements for the correct preparation and interpretation of Health Monitoring results.